The U.S. unemployment rate has hit double digits for the first time since 1983 - and is likely to go higher. The 10.2 percent jobless rate for October shows how weak the economy remains even though it is growing. Rising unemployment also could threaten the recovery if it saps consumers' confidence and makes them more cautious about spending as the holiday season approaches. Nearly 16 million Americans can't find jobs even though the worst recession since the Great Depression has apparently ended. The unemployed rate jumped to 10.2 percent, the highest since April 1983, from 9.8 percent in September, the Labor Department said Friday. The economy shed a net total of 190,000 jobs, more than economists had expected. The number of unemployed hit 15.7 million, up from 15.1 million. The job losses occurred across most industries, from manufacturing and construction to retail and financial. The job-loss total is based on a survey of businesses, separate from a survey of households that produces the unemployment rate. Economist Michael Darda, who forecast double-digit unemployment early this year, now sees a turn. "We are literally three months away from job losses stopping. And about 6 months away from job growth restarting in my view," Darda told CBS News correspondent Anthony Mason. But the economy has shed well over 7 million jobs in this recession, and economist Lakshman Achuthan tells Mason the hardest hit is manufacturing. "Even if GDP grows at 10 percent, you're not getting those jobs back. It's a structural permanent change," he said. Economists say the unemployment rate could reach 10.5 percent next year because employers remain reluctant to hire. President Barack Obama called the new jobs report another illustration of why much more work is needed to spur business creation and consumer spending. Noting legislation he's signing to provide additional unemployment benefits for laid-off workers, Mr. Obama said, "I will not rest until all Americans who want work can find work." Still, counting those who have settled for part-time jobs or stopped looking for work, the unemployment rate would be 17.5 percent, the highest on records dating from 1994. "It's not a good report," said Dan Greenhaus, chief economic strategist for New York-based investment firm Miller Tabak & Co. "What we're seeing is a validation of the idea that a jobless recovery is perfectly on track." Republicans quickly pounced on the double-digit unemployment number. "With so many families looking for work, it is time the Obama administration stop spreading their phony 'saved or created' talking points and start creating the dependable jobs America needs," Republican National Committee Chairman Michael Steele said in a statement. Last week, the Obama administration touted White House stimulus efforts as having , through a mix of federal contracts and tax cuts. Friday's report is the first since the government said last week that the economy grew at a in the July-September quarter, the strongest signal yet that the economy is rebounding. But that isn't fast enough to spur rapid hiring. "You need explosive growth to take the unemployment rate down," Greenhaus said in an interview Thursday. The economy soared by nearly 8 percent in 1983 after a steep recession, Greenhaus said, lowering the jobless rate by 2.5 percentage points that year. But the economy is unlikely to improve that fast this time, as consumers remain cautious and tight credit hinders businesses. In fact, many analysts expect economic growth to moderate early next year, as the impact of various government stimulus programs aimed at home and car buying fade. The stock market seesawed in early afternoon trading. The Dow Jones industrial average added about 25 points, while broader indexes were mixed. High unemployment is likely to become a political liability for Obama and Democrats in Congress. Most economists expect the jobless rate will remain above 9 percent through next November, when congressional elections are held. When unemployment topped 10 percent in the fall of 1982, President Ronald Reagan's Republican Party lost 26 seats in the House. Republicans and Democrats on Capitol Hill traded blame over the unemployment figures. Rep. Barney Frank, the Massachusetts Democrat who chairs the House Financial Services Committee, said the economy would have been much worse had congressional Democrats not approved Obama's $787 billion stimulus package in February. Republicans countered that Obama's focus on increased spending was making things worse. "More debt, more spending ... clearly has not worked - particularly in a time of double-digit unemployment," said Senate Republican leader Mitch McConnell of Kentucky. One sign of how hard it still is to find a job: The number of Americans who have been out of work for six months or longer rose to 5.6 million, a record. 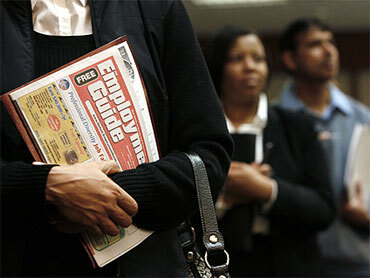 They account for 35.6 percent of the unemployed population, matching a record set last month. Congress sought to address the impact of long-term unemployment this week by approving legislation extending jobless benefits for the fourth time since the recession began. The bill would add 14 to 20 extra weeks of aid and is intended to prevent almost 2 million recipients from running out of unemployment insurance during the upcoming holiday season. October was the 22nd straight month the U.S. economy has shed jobs, the longest on records dating back 70 years. The report showed job losses remain widespread across many industries. Manufacturers eliminated a net total of 61,000 jobs, the most in four months. Construction shed 62,000 jobs, down slightly from the previous month. Retailers, the financial sector and leisure and hospitality companies all continued to reduce payrolls. The economy has lost a net total of 7.3 million jobs since the recession began in December 2007. The average work week was unchanged at 33 hours, a disappointment because employers are expected to add more hours for current workers before they begin hiring new ones. There were some bright spots in the report. Education and health care added 45,000 jobs. Professional and business services companies also added 18,000 jobs, according to the government report. And temporary employment grew by 33,700 jobs, after losing positions for months. That's a positive sign because employers are likely to add temporary workers before hiring permanent ones. "That is always in our business a precursor to more permanent jobs becoming available," said Tony McKinnon, president of Management Recruiters International, an executive recruiting firm. Still, economists expect jobs likely will remain scarce even as the economy improves. Diane Swonk, chief economist at Mesirow Financial, said that small businesses, a primary engine of job creation, still face tight credit and don't have the cash reserves to support extra workers. And many companies are squeezing more production from their existing work forces. Productivity, the amount of output per hour worked, jumped 9.5 percent in the third quarter, the Labor Department said Thursday. That's the sharpest increase in six years and followed a 6.9 percent rise in the second quarter. The increases enable companies to produce more without hiring extra people. While the unemployment rate hasn't yet topped the post-World War II high of 10.8 percent set in December 1982, many experts say this recession is worse. The work force, on average, is older now as the baby boomers have aged and fewer teenagers are out looking for work. Gary Burtless, an economist at the Brookings Institution, notes that older workers are more likely to be employed than younger ones. As a result, it takes a tougher job market to push the rate to 10 percent. "This may be the toughest employment situation we've seen in the postwar era," Mark Gertler, an economics professor at New York University, said in an interview earlier this week.